The managers Elea and Bahram were incredibly helpful and efficient! Very accessible to the waterfront walkway, restaurants, the castle, wtc. 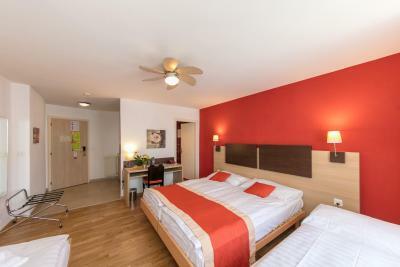 This place is fantastic, location, price, room comfort, staff are friendly and helpful and yes you have tea and coffee facilities in your room. 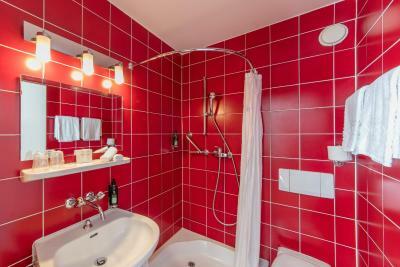 Bathroom clean and ours was red tiled just loved it. Highly recommend this place to people visiting Montreux. Love Montreux. Thank you Bon Port Hotel. Room is big enough for 3 people. Cleanliness can be better. Location is good. Breakfast was really good. Bed confortables and the room with a lot of light. All the staff are very friendly and helpful. They offered us to use microwave in their kitchen. Although it’s summer and we’re afraid it will be too hot, luckily there’s a fan in the room! Location is great. 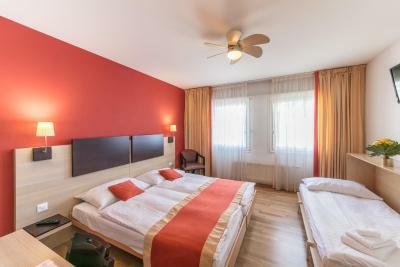 Walking distance to the lake or even train station. 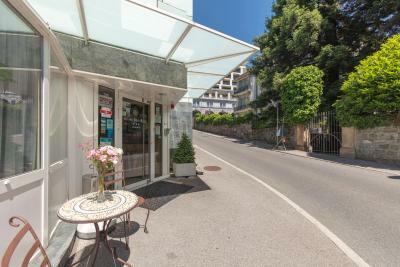 But if you have big luggage, you might want to take bus (it’s a bit uphill) and the hotel is quite near the bus stop too. 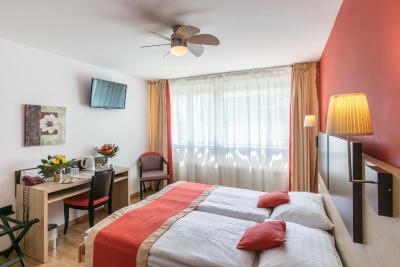 The room and bathroom are quite clean and they have daily room cleaning service. Situation - close to lake. Bus route close by. Friendly and comfortable. The staff is very nice. The location is okay; near the lake and bus station. Bon Port This rating is a reflection of how the property compares to the industry standard when it comes to price, facilities and services available. It's based on a self-evaluation by the property. Use this rating to help choose your stay! 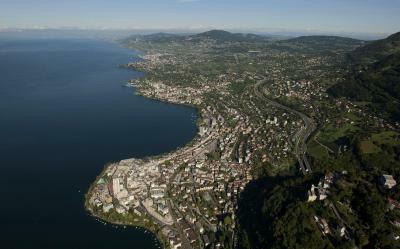 Only 350 feet away from Lake Geneva, Hotel Bon Port is conveniently located in the heart of Montreux. 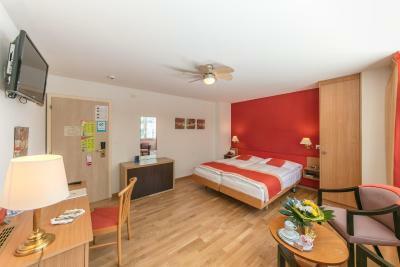 Free WiFi access is available in all areas of the property. 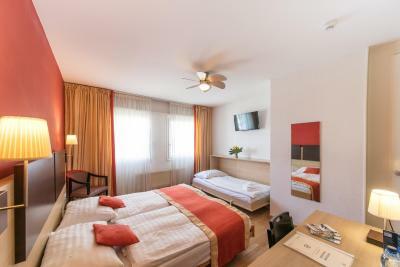 All rooms feature a private bathroom, a flat-screen TV with cable channels and tea/coffee making facilities. 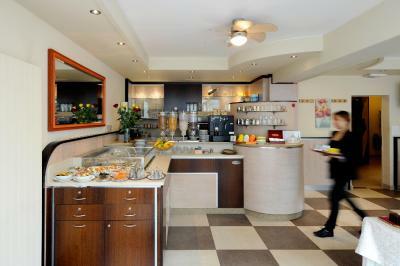 Guests have access to a computer and a printer, and they also can make use of the vending machine with a selection of drinks. 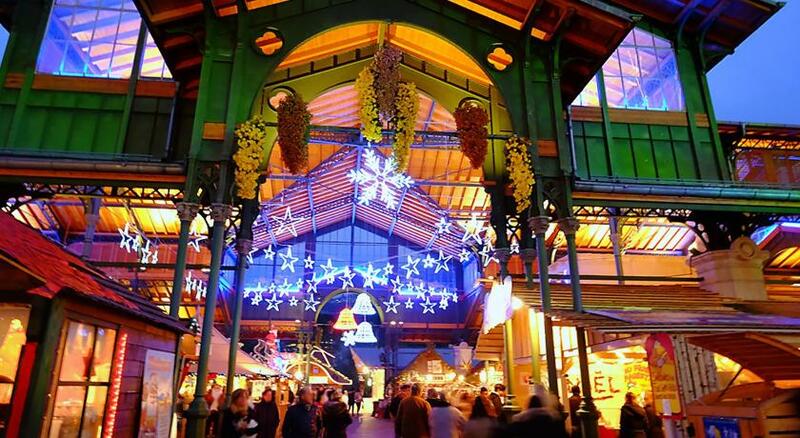 The Music and Convention Center and many shops are only a 15-minute walk away from Hotel Bon Port. Local public transportation is available free of charge. 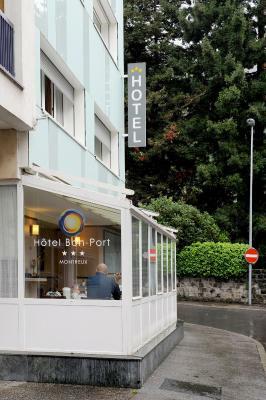 When would you like to stay at Bon Port? 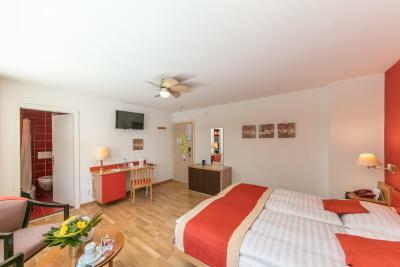 Room with attached bathroom with a flat-screen TV with cable channels and tea/coffee making facilities. Please note that only 1 extra bed is available in this room. Please note that a kitchenette is available in some rooms upon a request and for a surcharge. House Rules Bon Port takes special requests – add in the next step! Bon Port accepts these cards and reserves the right to temporarily hold an amount prior to arrival. Please note that the reception closes at 23:00. 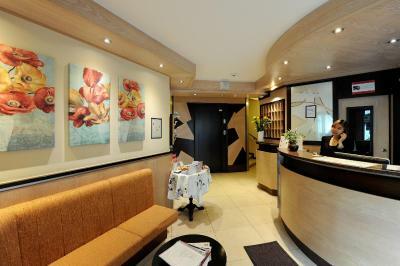 If you arrive later, please contact the hotel by phone in advance to receive instructions on how to check in. 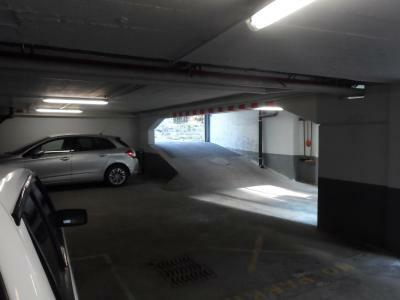 Please note that only cars up to a height of 71 in will be accepted at the hotel parking. 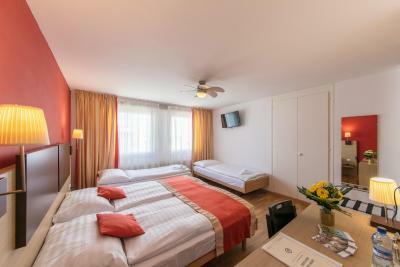 Please note it is not possible to add an extra bed to the single room and the quadruple room. 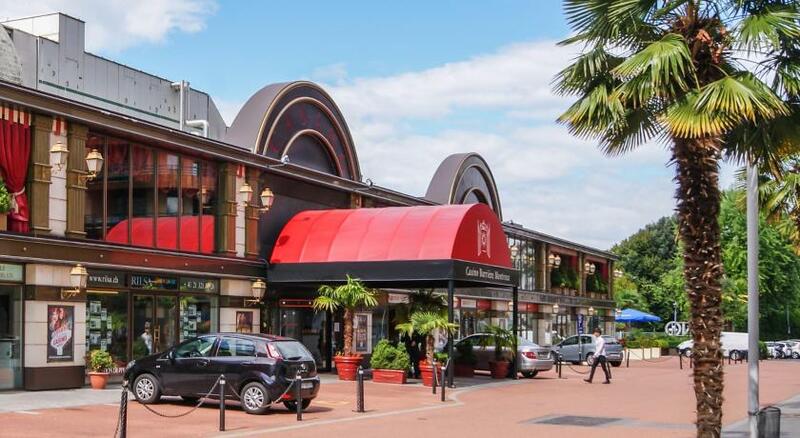 The facility is very close to the Montreux Casino, which was very comfortable for us since we were travelling to Montreux to visit the Queen Studios. Staff was very kind and helpful. They also agreed to let use use the parking spot for a couple of hours after our check-out. We really appreciated it. The internet connection is not so good, I had several problems even though my room was in the 1st floor; I didn't get the 4G and 5G in my room. They tried to restart the router but it didn't work for one night for me in the room. Also, I had to shower with cold water one day as they had problems but didn't even tell me, then offered a coffee when I complained. Average hotel really.. but for the price, well..
when the first day we arrived, the hotel offer us a room not same as we booked, that room was very small for 2 people, and with dust on the floor, we even couldn't and lay our luggage on the floor, even after shower still feel not clean because of the dusty enviroment, the hotel change the room we should have for us next day, after we complent, but said nothing about that..., think we should get refound for the first night, that was very bad experience for us. 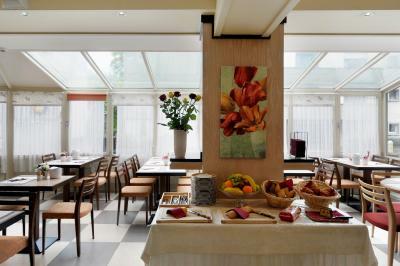 the breakfast was fine for its value, it is simple, less choice,but enough for extra F$11 per person , the employees were very friendly and helpful, when we asking for day pass he provide us immediatly, and other travel information he know. The choice of restaurants closest to the hotel wasn't that great. Perhaps the time of year I visited wasn't right...? 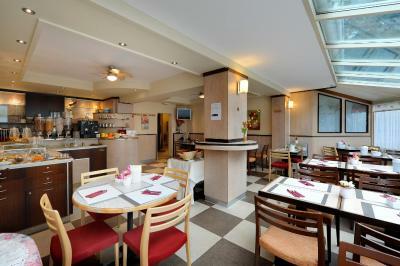 The hotel is central and close to train station and bus stops. Stones throw away from a lovely walk by the lake. 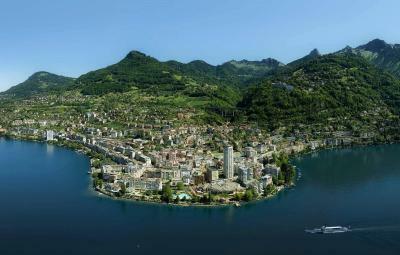 Great location, considering it is Switzerland the prize was fair enough. Had a fantastic stay at Bon Port. Perfect location. Staff were helpful and friendly. Hotel was clean. 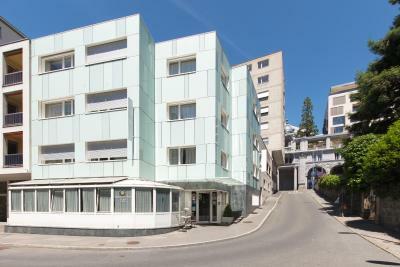 Would definatley recommend to anyone staying for a few days in Montreux. Nice coffee, nice breakfast. The location is quite good both near the higher old part on the mountain and the lakeside. WiFi, too small washroom and services. Cleanness and sufficient life with nice location.